Solitude is Oneself is tranquil, relaxing, “chill”, minimalist, expressive, peaceful music for solo piano, composed and performed by Juan María Solare. This music can be “used” for meditation, study, learning, sleeping, relax or praying. Keywords: New simplicity, Neoclassical, Post-Romantic, Instrumental. Don’t see any negative aspects in Solitude. In Spanish there is only one word for Solitude and Loneliness (namely “Soledad”). Loneliness is a state of isolation, without dialog, feeling abandoned and without external points of reference. But I conceive Solitude as a highely creative state, in which one is faced to what one actually wants to achieve, with one’s thoughts, with one’s self. 1) Never Underestimate the Difficulties of Simple Things. Lots of times I have seen this in several persons – and in myself: when something is simple, easy and uncomplicated, we tend to underestimate it too much and its hidden difficulties end up tackling us. We leave to the last moment a text that seems easy to learn, and we do not assimilate it as we could. Or a chess game that is (really) won, but we feel over-confident, we play with superficiality, we make slight mistakes one after the other and lose control of the situation. 2) Too Much But Still Not Enough. The title aludes to current life in those human groups or societies that put an extremely strong stress in performance/efficiency at all costs, at any price. If you don’t get first prizes always, non-stop, you are a nobody. If you get a second place in a maraton where a thousand participated, your only merit is being the best of the losers. If you are the subchampion / runner-up of anything, nobody will remember you in a few years. This obsession for all or nothing leads to high levels of anxiety. All that you do is too much for your (mental, affective or physical) health, but anyway not enough for the system. 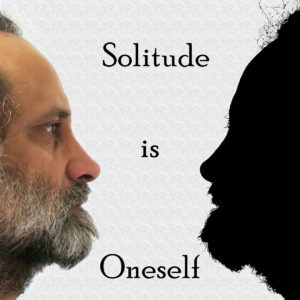 The ArtWork (Cover Art) of Solitude is Oneself shows a human face (concretely the composer’s) faced simmetrically to its silhouette, in black. This illustration alludes to the title. It is oneself (the person) facing his own solitude, his internal misterious being. A real human facing his own shadow. It is not a negative shadow: is the shadow of which Shamanism speaks, the own shadow from where one draws strength. This album was released on Friday 17 August 2018 on Spotify, Deezer, Apple Music, Qobuz, Tidal, Amazon mp3 and nearly all streaming platforms you can imagine. These piano pieces are dedicated to Mr. Cadmiel Pérez from República Dominicana. Download Solitude Is Oneself [piano] sheet music instantly – Piano Solo sheet music by Juan María Solare: Juan Maria Solare. Purchase, download and play digital sheet music today at Sheet Music Plus. Solitude is Oneself: Three music pieces, each in two versions: for electric piano (Rhodes) and for acoustic piano (Steinway). Peaceful music composed by Juan María Solare. New simplicity, Neoclassical. Instrumental.